Bentley took charge of Morecambe in 2011. 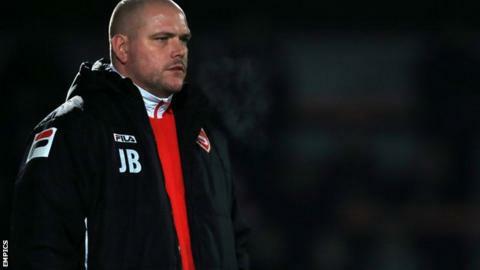 Morecambe manager Jim Bentley has said his players must hold their focus after putting together an encouraging four-game unbeaten run. The League Two Shrimps have won their last three matches, including a 2-0 win over in-form League One Walsall in the Johnstone's Paint Trophy. "It's important that we go from game to game," Bentley, 39, said. "I've learned that when you start looking too far ahead, that's when you get your backside spanked." Morecambe sit sixth in the League Two table, having taken seven points from their last three games, and face bottom-side Newport County on Saturday. "You've got to make sure you give every game that comes round your utmost and you do your homework on the opposition," Bentley added. "That's what we're going to do this week with regards to Newport."